Burlap and lace, the perfect combination. Aren't these table runners fabulous? I haven't ever seen this combo before, but you can find a wide variety here. Would you like the chance to win one of your own? Each one features *vintage* lace and serged, clean-finished edges. You get to choose the length and width for you table. To enter the giveaway all you have to do is leave a comment with your email address on this post. For an additional entry, you can "favorite" the little flower linen shop on etsy. I have "favorited" little flower linen..she has some great pillows also!! How lovely! Thanks for the giveaway! Adorable and a perfect combonation! Fabulous combination! Rustic and chic paired perfectly. Beautiful! Thanks for this giveaway! Melaine a beautiful look that will "make" a table scape wonderful! Lovely giveaway! Hi Melanie. Your table runner is so pretty. Thanks for letting me enter your giveaway. I also liked this one too in your shop. Burlap & Ruffles Table Runner, Double Ruffles -- 15" x 72"
I forgot to leave you my email in my last comment. I'm smitten.... Love the ying and yang of it! Thank you for the chance to win. These are gorgeous! I make them with ruffled white muslin, but am loving the lace on hers! I would LOVE to win one, Melanie. Thank you for the opportunity! that would look so good on my table! they are just beautiful! How pretty! I would love to win! I "favorited" Little Flower Linen on Etsy. What a lovely combination for a table runner! I'd love to win it!! What a sweet giveaway!! The pillows are as fabulous as the runners! Please toss my name in the hat! I love this combo, a little rustic, a little refined. 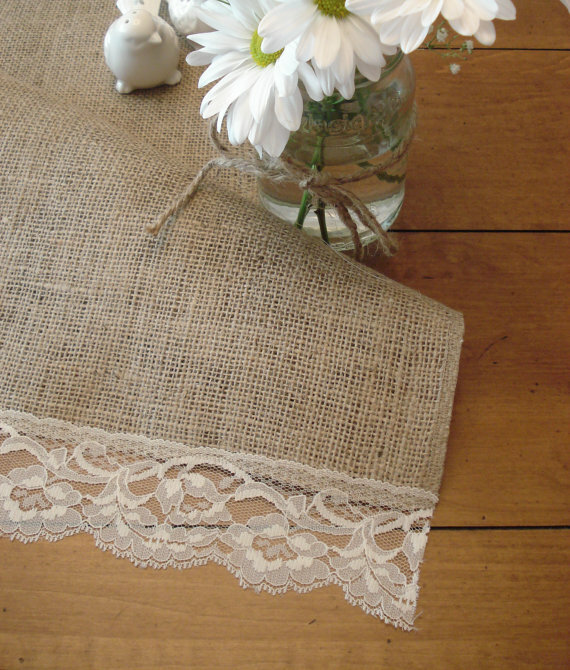 I love the combination of burlap and lace, they look so perfect together. Loving it! I have a little soft spot for burlap. Super cute! Rustic and feminine together! would look great with my farmhouse chic decor! That's such a neat combination! I love this combo! It's so pretty for every season. I am in love! These are so beautiful! Well, I'd sure be thrilled to have one for our table! It would match a lamp shade I have in our dining area! These would be perfect in my country house. Thanks for the giveaway. Sooo pretty! LOVE! I tried to use the link on your page, but it wasn't working? Would be a perfect addition to my kitchen table! Very lovely. Thank you for the opportunity to win this beautiful runner. I have just the place for this!! Thank you for the gorgeous giveaway! 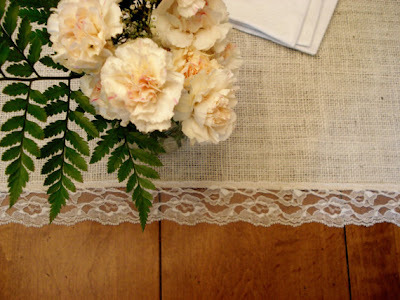 I love the contrast of the lace with burlap. Great giveaway! Loving the Burlap and Lace together! Beautiful! I actually need a new runner! I love the burlap and lace combination! Pretty! Would love to win one. I've been wanting a burlap runner FOREVER! These are so pretty. I love the roughness of the burlap against the delicate lace. Little Flower Linen is not one of my favorite shoppes! thanks for the 'heads up'. Adorable! And perfect for fall. Love love love!! !Would be perfect for my dining table once I refinish it!! My Daughter is using burlap in her wedding decor...I love the combination of lace and burlap. Oh, what a cute combo! I haven't seen it before either. Thanks for the giveaway. I "favorited" the shop too :-) thanks! Love the combination of burlap and lace'! love them! I had thought about making some like it for my wedding reception but decided to not add lace. Beautiful! I have "favorited" Little Flower Linen too! Love the runners!!! The combination of the burlap with the lace is so pretty. Thanks for the opportunity to enter. how sweet! I hope I win! Those are really beautiful! Thanks for the giveaway. These are stunning! The lace is gorgeous. Would love to win this! These table runners are great! I want one!! I love the lace and burlap together!! Thank you for the opportunity to win one of these beautiful runners! LOVE THEM! Pretty and perfect for fall. I love those!! I haven't seen that combo before :) Thanks for the opportunity to win one! Just gorgeous...thanks for the chance! Added them to my favorites!! Oh, how lovely. 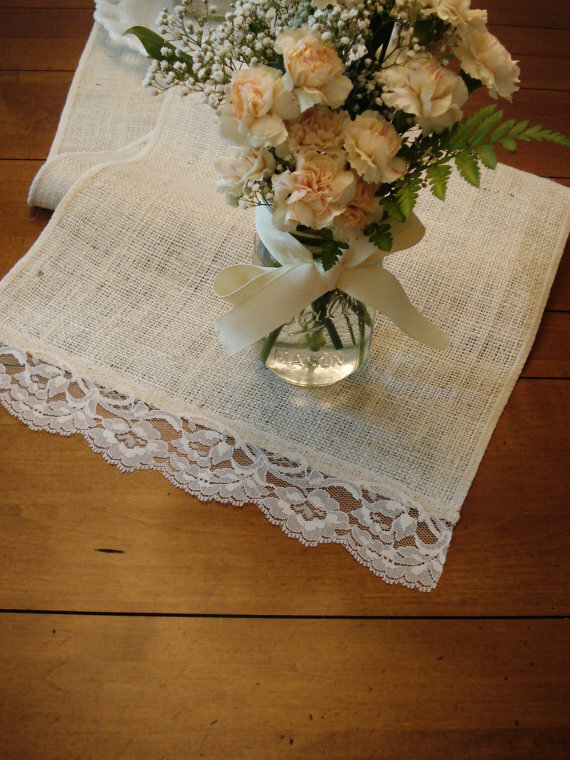 Burlap and lace - I never would have put them together. I guess that is why she has the delightful shop and I don't!! I would love to win the table runner. thanks for sharing this. These are so sweet with the lace edges. Thanks for the giveaway. I would love to be entered, what a great piece! So creative!!! 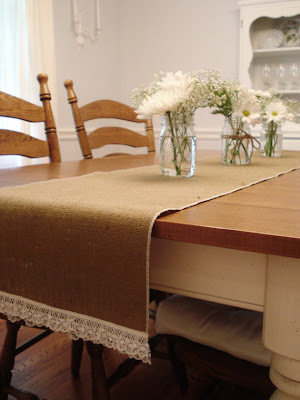 Burlap and lace is such a perfect combination and who would have thought it was so. Thanks for the chance to win. LOVE THIS!!! It'd look sooo fab in my new home. Hope to win and thanks for the chance! Thanks for the giveaway - I would love to win the burlap runner! I love burlap and lace, a great combination for sure. I love the idea of burlap & lace - how sweet!! Love it. I would love to have one of these lovely runners! I am brand new to your blog and it is divine! Thanks for the giveaway. That runner is to die for. Wow. Beautiful. Here's hoping - my table could use some beautification! I also added her to my favorites on Etsy. Thanks again for the chance! I just love this!!!! It would be the perfect start to my fall decorating! Thanks for the chance!! !